Locavores rejoice! There’s a new farmers market coming to town! 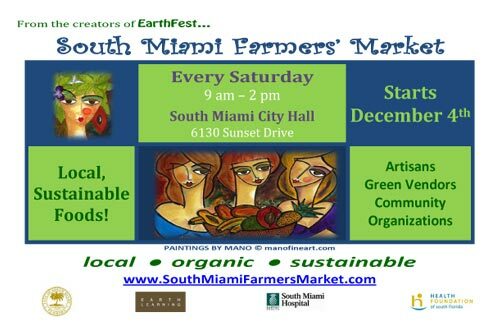 The South Miami Farmers Market starts Saturday, December 4th, and will run every Saturday from 9 a.m. to 2 p.m. The location is in the parking lot in front of South Miami City Hall, 6130 Sunset Drive. The market will run year-round, and will feature prepared food vendors, artisans, green technology vendors, and community groups. This new market will showcase the best local, organic and sustainably-grown produce in season (tropical fruits, annual and perennial vegetables, mushrooms), eggs, dairy, and value-added products (jams, jellies, salsas, fermented and pickled foods). Only local growers will participate in this market. Food will come from local area organic growers (including participating members of Redland Organics), community gardens and backyard growers. The market will also sell edible and native plants. Great to know. Thanks for keeping us up to date. I reposted this on Facebook so all my friends in the south Miami area are aware, too. Thanks for the FB re-post. Check out the next entry. There’s more grower-supported markets opening up in the next week or so.